AMMONNEWS - Three people are dead and nine wounded after a gunman opened fire in a tram in the central Dutch city of Utrecht says the city's mayor Jan von Zanen. Dutch authorities have raised the threat level to its highest, and Prime Minister Mark Rutte said all efforts were focusing on the "suspect or suspects" responsible. "Our country today has been jolted by an attack in Utrecht," Rutte said in a statement. "Police and prosecutors are looking into what exactly happened. What's known now is that there was shooting at people sitting in a tram in Utrecht, that there were wounded, and possibly deaths." Police, including heavily armed officers, flooded the area after the shooting happened on Tuesday morning at a busy traffic intersection in a residential neighbourhood. Utrecht police issued a photo of a 37-year old man born in Turkey Gokman Tanis, "in connection with the incident" warning "Do not approach him yourself, but immediately call" authorities. 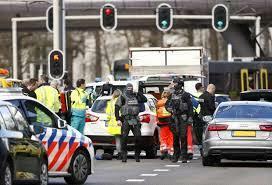 Dutch broadcaster NOS said police surrounded a building where the suspected gunman was believed to be holed up. “We are still not able to rule out a terrorist motive,” said Pieter-Jaap Aalbersberg National Coordinator for Counterterrorism and Security (NCTV). With the threat level raised until at least 6pm local time (19:00 GMT) schools were told to shut their doors and paramilitary police increased security at airports and other vital infrastructure. Security was also stepped up at mosques. A witness told NOS he saw an injured woman running from the tram. She appeared to have been shot in the chest and had blood on her hands and clothes. "I brought her into my car and helped her. When the police arrived, she was unconscious," NOS cited the witness as saying. Political parties have announced they are suspending campaigning for the provincial elections that are due to take place on Wednesday. Rutte convened crisis talks, saying he was deeply concerned about the incident, which came three days after the killing of 50 people in mass shootings at two mosques in the city of Christchurch, New Zealand. "An act of terror is an attack on our open and tolerant society," the prime minister said. "If this is a terror attack, then there is only one answer: our rule and democracy are stronger than fanaticism and violence. We will not accept intolerance."